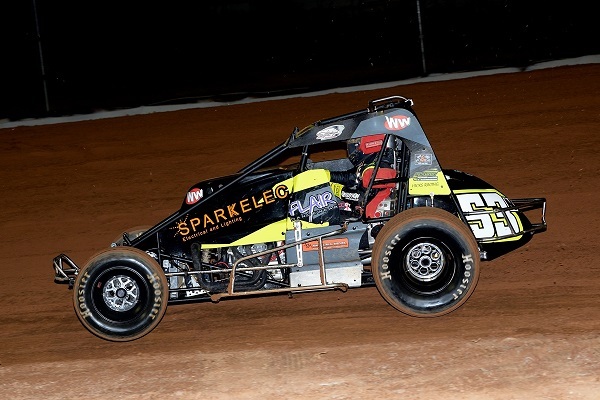 Itâ€™s been a LONG road to recovery for Jeff Thomas after breaking his collarbone last season, but all that was put aside after winning the Wingless Sprints A-Main on Saturday night at Valvoline Raceway. Jeff put on a clinical performance leading every lap of the main event to defeat last start winner Harley Smee and Luke Sayre. By virtue of the invert for the 25 lap final, Thomas started the race on pole and hit the lead from the drop of the green. The race was just four laps when disaster truck for John McRae when he flipped on the main straight. He emerged A-OK from the car but was out of the restart along with Victorian Luke Wheel, Geoff Piekar and Jamie Dicker who were also caught up in incidents. The remaining twenty-one laps ran caution free however there were some anxious moments on the rough track surface with many drivers having some close calls. Following Jeff Thomas, Harley Smee and Luke Sayre home was Jason Bates, Jason Davis, Victorian Travis Millar, Queenslander Glenn Wright, Ashleigh Jack, Michael Sammut and Mark Blyton rounded out the top ten. Remaining positions were filled by Zac Pacchiarotta who came from the B-Main, Dean Thomas, Cody Boulding, Graham Flood, Troy Carey, Peter Granger, Jeff Neve and Jarrad Rust was the final finisher. Non-finishers were Kyle Angel, Sean Dicker, Luke Wheel, John McRae, Geoff Piekar and Jamie Dicker. Earlier in the night, ten heat races were conducted due to the car count and wins went to Luke Wheel (x2), Cody Boulding, Jeff Thomas, Dean Thomas, Harley Smee, Glenn Wright, Luke Sayre, Jason Bates and Travis Millar. B-Main one was claimed by John McRae and B-Main was taken out by Jeff Neve. The NSW Wingless Sprints would like to congratulate all drivers on another great performance and thank the interstate competitors who travelled to Sydney to race. The next event on the calendar will be November 11 when the Wingless Sprints return to Gilgandra Speedway.